Batala is the eighth largest city in the state of Punjab, India in terms of population after Ludhiana, Amritsar, Jalandhar, Patiala, Bathinda, Mohali and Hoshiarpur. It is a municipal council in Gurdaspur District in the Majha region of the state of Punjab, India. It is located about 32 km from Gurdaspur, the headquarters of the district. It is also a Police District. Batala ranks as the most populated town of the district with 31% of the total population of district. It is the biggest industrial town in the district. It is the centre of the Majha region of Punjab. Batala is important place for Sikh devotees. Guru Nanak Dev Ji, the founder of the Sikh religion was married here to Sulakhni, the daughter of Mul Chand Chauna in 1485. Many temples and gurdwaras related to the guru's marriage attract devotees from near and far. Every year celebrations are conducted on the anniversary of Guru Nanak's marriage. There is also a historical gurdwara Satkartarian sahib related to 6th guru of sikhs Shri Hargobind ji. Also, it is an important place for Hindus as the most powerful god of Hindu culture Lord Shiva came here at mandir Achleshwar Dham with 33 crore devi-devtas to make happy his son Kartikeya who was sad due to his loss of race from his brother and Lord Shiva's son Ganesha. Batala was once known as the Iron Bird of Asia as it produced the highest amount of C.I. Casting, agricultural and mechanical machinery. Batala is still one of the leading cities in Northern India in manufacturing of C.I Casting and mechanical machinery. It's also an agricultural marketplace and industrial center. Cotton ginning, weaving, sugar refining, and rice milling are some of other industries taking place here. The interesting fact about Batala is that this city is called Tehsil but it is more developed than its district Gurdaspur. Nowadays people are protesting and participated in agitations in regard of their long standing demand of district and municipal corporation status to Batala. The city was founded in 1465 CE by Raja Ram Deo, a Bhati Rajput, during the reign of Bahlul Lodi on a piece of land given by Tatar Khan who was the Governor of Lahore. Later, during the Mughal rule, Akbar gave it in jagir to his foster brother, Shamsher Khan. The city grew and developed under him. Batala was a very famous city of the Punjab region, just like Lahore, Jalandhar and other major cities in the 16th century, and it is 109 years older than Amritsar. The whole city was lying within a fort. It had 12 gates as entrances and exit. These gates are still known by their old names, e.g. Sheran Wala Gate, Khajuri Gate, Bhandari Gate, Ohri Gate, Thathiari Gate, Hathi Gate, Pahari Gate, etc. Some of them still survive although their condition is in need of attention. In 1947, at the time of India's partition, Batala was included in Pakistan. But later Indian leaders realized that in this way the nearby major city of Amritsar would be surrounded by Pakistan on two sides. To avoid this danger to Amritsar, Batala was negotiated back to India from the British. For a total of 3 days, Batala was part of Pakistan, then added to Indian territory. During the political integration of India, Batala was included in the Punjab state. Other historic places in Batala are gurdwaras where Guru Nanak stayed during his lifetime. There are also numerous other gurdwaras of significant importance to Sikhs and therefore attract thousands of Sikhs from around the globe. Batala grew under the Muslim governor. The Muslim community was in the majority in Batala till partition. After partition, however, many Muslims left Batala and went to Pakistan. Then Hindus and Sikhs settled there and Batala now has a Hindu majority which holds more than 56% of city's total population. Located in Gurdaspur district, 38 km from Amritsar on the Kashmir Grand Trunk road. 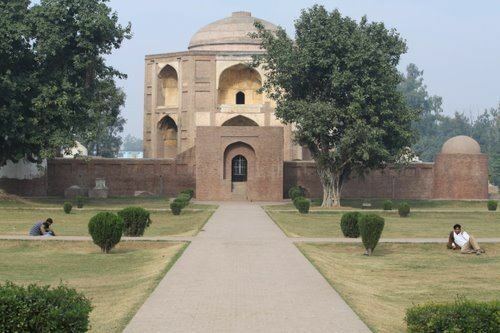 One of the older towns in the province of Lahore in earlier times, Batala is home to many monuments of religious and historic importance, such as Hazira Park, Barah Dari, Hakikat Samadh.These monuments are connected with Sikh history and the Mughal period. The city consists of several churches constructed during the British Raj. The Jal Mahal and the palace of Maharaja Sher Singh were built by the Maharaja (CE 1780–1839). The palace is under the control of the authorities of the local Baring Union Christian College. The administrative offices of the college are housed in it. Jal Mahal is under the control of the Archaeological Survey of India (ASI). Jal Mahal (Baradari) and the palace of Maharaja Sher Singh were connected through a tunnel. According to some senior citizens, Shamsher Khan Tank of Jal Mahal used to be filled with water through the tunnel, which was further connected to a long tunnel (canal) to the Beas, near Kahnuwan. The remnants of the tunnel can be seen near Baring Christian College. Maharaja Sher Singh used to hold meetings of his courtiers in Jal Mahal. The water reservoir was built by Shamsher Khan while the beautiful Baradari in the centre of the tank was constructed by Maharaja Sher Singh. It has a square room in the centre of a pavilion with a passageway. The entry to the first floor is by a staircase with concave-shaped steps on the north-eastern canal. Jal Mahal has eight doors in the lower part of the building and four in the upper storey. The inner wall contained beautiful art glass carvings and wall paintings. However, major parts of the paintings have been erased or damaged. The roof of the pavilion has also fallen. The Municipal Council provided a tubewell to fill up the tank till the eighties. All sides of the reservoir were lined with Nanakshahi bricks. However, with the passage of time the brick lining has been destroyed. Nowadays, on one side of the tank is located a vridh ashram owned and managed by the Dainik Prarthana Sabha. There also exists Bhadr Kali Mandir and Shivala. The upper portion of Jal Mahal is in a dilapidated condition and the time is not far when this magnificent structure will pass into oblivion. Guru Nanak was married here to Bibi Sulakhani. He was engaged to the daughter of Mul Chand Chauna who along with the Brahmin priests insisted on a traditional Hindu marriage while Guru Nanak wanted a simple marriage. Guru Nanak was sitting beside a crooked mud wall (kandh) discussing the marriage plans with the Brahmin clergy. It was planned to push the wall on top of the Guru but Guru Nanak was warned of the plan by an old woman. Guru Nanak just smiled and said "This wall will not fall for centuries. The will of God shall prevail." The wall is still preserved within the Gurdwara and a celebration is held here every year on the anniversary of Guru Nanak's marriage. At walking distance of two minutes there is Gurudwara Dera sahib, which was house of mata sulakhni ji (bride of Guru Nanak dev ji). An ancient well is situated in Gurudwara dera sahib, it is said that water of well is having special curing powers in itself. Another very famous and the most-visited devotional place here is the temple dedicated to Goddess Kali. It’s situated in the heart of city i.e., Chakri Bazar and maximum rush is seen on Tuesdays. During Navratri time, a lot of people from city and surrounding region visit the temple. People of Batala and outside have true faith on Mata Kali Dwara Mandir. Many other temples are also situated in Batala City. As per provisional data from the 2011 census, the Batala urban agglomeration had a population of 158,404, out of which males were 83,536 and females were 74,868. The literacy rate was 85.28 per cent. Foundry sand is found in Dharamkot, near Batala; the deposits are located 6.5 km west of Batala. Exposed on both sides of Batala-Dera Baba Nanak road, the Dharmkot sand is a natural moulding sand, containing about 20% clay. Another deposit which is about 4 metres thick, occurs at about 6 km from Batala on the Batala Qadian road. The sand has a yellowish tinge on the surface, but is reddish brown at a depth of about 1 metre. The sand deposits are also found at Bhagwanpur about 15 km west of Batala on Dera Baba Nanak Road and about 10 km from Gurdaspur on the Gurdaspur Naushera Road (20 percent clay). Salt petre occurs in the district at the villages of Thikriwala, Pandori in the tehsils of Gurdaspur and Dhawan, Chataurgarh and Badowal in the tehsil of Batala. It is a source of potassium nitrate which can be used for making crackers and gunpowder, in the match and sugar industries, and as fertilizer. Batala is an important industrial town famous for the manufacture of machine tools and woolen products. Therefore, it is well connected with the other cities and towns of Punjab by road and railways. Government and private buses are the main source of journey to other cities. Batala has the only government bus depot in the district. National Highway 15 connecting Kandla in Gujarat with Pathankot in Punjab passes through Batala and connects it with Pathankot, Amritsar, Bhatinda, Sri Ganganagar, Bikaner, Jaisalmer, Barmer and Kandla. Batala is also well connected by State Highway with NH1, thus connecting it with Jalandhar, Ludhiana, Chandigarh and New Delhi, the capital of India. Batala railway station (station code BAT) is on the Amritsar-Pathankot line of the Firozpur division of the Northern Railway zone of the Indian Railways. Amritsar Junction Railway Station located about 38 km from the town is the nearest major railway station. Train to Qadian is another diversion from Batala. Ministry of Railways has accepted in 2010 Budget plan to connect the Batala-Quadian rail link to Jalandhar via Beas Junction. The project would start soon. This project will help connect Batala to high-speed Amritsar-Delhi section and cutting travel time to Jalandhar by 1 hour, with no need to go via Amritsar. Guru Ram Das International Airport serving the city of Amritsar is the nearest international airport and is located about 40 km from the town.Pathankot Airport in Pathankot, situated 70 km away from Batala is the nearest military airport. Batala has a good number of schools and colleges affiliated to different boards. Mumtaz Mufti - Renowned Pakistani writer, philosopher and psychologist, awarded the high Pakistani civilian award Sitara-e-Imtiaz and Munshi Premchand award. Bhupinder Singh Mann - Ex Member of Parliament (Rajya Sabha from 1990–96), nominated by President of India for outstanding contribution to the cause of Indian Farmers. Prabhjot Singh - famous Hockey player of Indian Men's Hockey Team. The town is home to steel and wood (cricket bats) industries.